The holidays are fast approaching, which means it’s time to get a jump start on those menu plans. If you need a little extra help picking out a dessert, You Tube’s James Wright Chanel is here with the answers. After finding out Patti LaBelle, one of his favorite stars, had a line of sweet potato pies for sale at WalMart, James Wright Chanel did what any true fan would do and bought five pies, turned on the camera, and reviewed them. James’ video review of Patti LaBelle’s Sweet Potato pie is filled with iconic quotes, plenty of singing, and most of all, it will have you instantly craving that sweet potato pie. 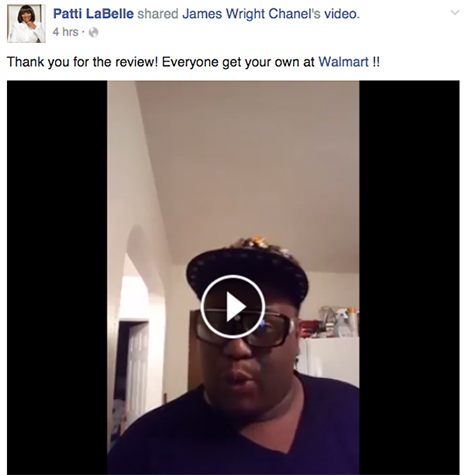 Even Patti LaBelle herself recognized James Wright Chanel’s incredible review, taking to Facebook to express her appreciation. Shout out to Patti LaBelle. Thanks to this review, the sweet potato pie might become the next staple at the Thanksgiving dinner table.